A motor agent and engineer from the Midlands, Ken Wharton was one of the most versatile drivers of his generation. 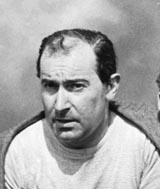 A leading hillclimber in the 1950s, he won the British title in four consecutive years from 1951. Even by then he was a highly experienced driver as he started out racing an Austin Seven in 1935 and went on to make his name in sprints. In 1952 he made his Formula One championship debut in an old-fashioned Frazer-Nash but to his credit finished fourth in Switzerland. He only broke into the top six once more in his career, again in Switzerland two years later. In that year he managed second in the non-championship New Zealand Grand Prix after a terrible crash at Albi. In 1955 he was set to be Vanwall's No. 2 driver behind Mike Hawthorn when he was burned after crashing in the non-championship International Trophy at Silverstone and quit F1. He was killed while driving a Ferrari in a sports car race in New Zealand.